"FOGGY MORNINGS CONTINUE HERE IN THE NORTHERN FOREST!" With temperature differences between the air & the lake water, fog is common in the early mornings. 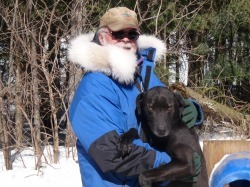 This was a another good week for training the dogs with ideal temperatures and dry weather. This was the first week this season that we were able to get in 5 training days. The interval training schedule now is 3 minute runs followed by 2 minutes rest. The dogs now have close to 100 miles of conditioning on them and are now ready to increase the distance to 8 mile runs. There are 2 new videos on You Tube of the dogs running this week. If you would like to view them , go to the "links" section and click on the You Tube link. Hi Stan, you are really doing great with your website and the vidos published on youtube. You enable me to stick to the pulse of your life at Miortuk.